Sprite Industries is a 28-year-old manufacturer of electronic water instrumentation and filtration products. 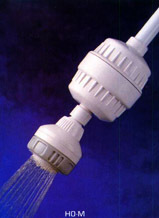 In 1987, Sprite introduced the Shower-Mite, a non-carbon shower filter. Since then, Sprite has produced more than 7 different shower filter models. 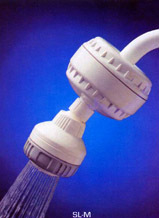 Today, Sprite is the premier authority in shower filtration technology, manufacturing, marketing and sales. With its many patents and proprietary filtration technologies, Sprite continues to set the pace and lead the way. Chlorine is universally used to chemically disinfect water. It kills germs, bacteria, and other living organisms. Chlorine readily passes through the cell wall and attaches to the fatty acids of the cell, disrupting the life sustaining functions. The human body is composed of billions of cells. Most people are aware that the quality of their drinking water can be improved by filtering their tap water or buying bottled water. However, many do not realize that they are addressing only a part of the problem. One half of our daily chlorine exposure is from showering. Chlorine is not only absorbed through the skin, but also re-vaporized in the shower, inhaled into the lungs, and transferred directly into the blood system. In fact, the chlorine exposure from one shower is equal to an entire day's amount of drinking the same water. Drinking filtered or bottled water only does half the job. For people who are concerned about their health and are willing to take the responsibility to do something about it, the Sprite Shower Filter is an affordable solution to the problem. Due to the development of Sprite's high temperature, catalytic filtration media, the second half of the problem can now be addressed. Carbon is an excellent filtration media when used under the right conditions, such as, in a point-of-use drinking filter. However, carbon-drinking filters are designed to filter tap water under conditions that are much different than found with shower water. The temperature of tap water ranges from 60°-75° (F). Showering temperatures typically range from 85°-105° (F). Carbon is a cold water filter. It is most effective at temperature ranges of 50°-80° (F). At higher temperatures, carbon becomes ineffective. It will "off-load" and release contaminants into the water. 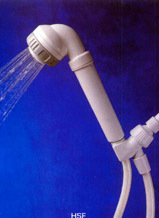 Sprite's shower filtration media was designed for hot water, becoming more efficient as the water temperature increases. The flow-rate of most drinking filters is less than 1/2 gallon per minute (GPM). Even using cold water, a minimum of 5x the amount of carbon would be necessary to filter the shower water. Most drinking filters produce 1-3 gallons per day (GPD). Shower usage ranges from 12.5-50 GPD. (12x greater). Even with cold water and a 5x larger carbon filter, the filter would have to be an additional 12x larger, or a total of 60x the size of the original tap water filter. Of course, you don't shower in cold water and wouldn't use a 60 lb. shower filter. And we wouldn't cut a carbon filter in half and expect it to adequately filter shower water. Instead, Sprite invested a great amount of time and energy into developing a line of reliable and realistic catalytic shower filters that filter out free and combined chlorine(s), dirt, sediment, odors, hydrogen sulfide, iron oxide, and more, from your shower water. When it comes to filtering shower water..."the choice is clear."